"reality check makes this a must read"
Misery loves company. There's just something oddly reassuring discovering that your life isn't the only one that's all screwed up. Learning to live with a less than perfect life rather than hiding from life's disappointments is the toughest route but the most necessary for survival. Getting over those rough patches is what makes us strong and in the end will lead us to the life we envisioned The one filled with happiness and love. But before you can find that life you first have to make a self discovery that's scary in its own right and that is you have to begin to love and respect yourself, flaws and all, and at the same time stop trying to live your life up to someone else's expectations. Stop looking in the mirror finding you wanting in any way. That's the underlying theme of this powerful book by Susan Mallery. There's a little street in Blackberry Island with three identically built homes affectionately known as the Three Sisters. But that's all they really have in common, their outer shell. All other attributes have been altered to the taste of their owners and for the most part reflect the personalities of those owners. Andi buys the third of these sister houses, the one that has been left to rot all these years from disrepair. Her plan is to turn it into her pediatric office and home. In truth she hadn't really cemented what her future was going to be when she left the city to start over in this sleepy little tourist town. She certainly hadn't thought ahead to a personal life. But in fairness she was running from the nightmare her old personal life had become. Being left at the altar pretty much ruins your day and when you realize you just wasted a decade on a man who got cold feet has you looking inward to what you really need. Andi spent most of her life trying not to disappoint others, her parents and then the ex fianc� almost groom jerk. It was tough to live up to others expectations when your own dreams just don't measure up. The ladies of the Three Sisters at first seem to have little if anything in common. Andi's a doctor, Boston an artist and the Deanna a homemaker. But aha appearances can be deceiving. With friends you can survive anything and as they begin to open the doors of their homes and their hearts to each other they begin to acknowledge their own inner strengths as they battle their individual demons. Conquering these demons is going to be tough but the rewards are vital to their survival. Living as they have will ultimately fracture their already fragile lives causing what could be irreparable damage to their marriages and families. Facing down those demons will take a lot of strength. Doing it alone is scary -- having friends to lean on and depend on can make the difference between success and failure. None of them can afford to fail -- it's just not an option. Sometimes family isn't the most dependable nurturer. Susan Mallery gives us a candid, honest look into the turmoil of family life when tragedies and personal crisis' occur. Welcome back to Blackberry Island. So nice to meet these newest additions to this lovely tourist town and visit with some old friends. 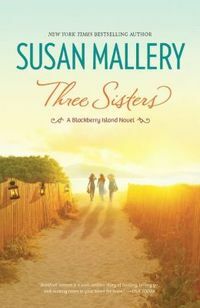 Mallery never disappoints her readers and THREE SISTERS is no exception. It's a winner and should be on everyone's short list of must reads. After Andi Gordon is jilted at the altar, she makes the most impetuous decision of her life � buying one of the famed Three Sisters Queen Anne houses on Blackberry Island. Now the proud-ish owner of the ugly duckling of the trio, she plans to open her own pediatric office on the first floor, just as soon as her hunky contractor completes the work. Andi's new future may be coming together, but the truth is she's just as badly in need of a major renovation as her house.